Indian Springs, NV – During peak rush hour traffic on Thursday, March 31 at Creech Air Force Base, military veterans and friends were arrested while waving Veterans for Peace (VFP) flags and nonviolently blocking traffic at the East Gate on Hwy. 95, the primary commuter gate into the base. As the traffic was impeded, Las Vegas police diverted cars up the highway to less used, alternative gates. At the same time, 20 people held vigil between the frontage road and US Highway 95 as four other peace and justice activists greeted the diverted traffic with a second peaceful anti-drone blockade expressed as a sitting silent meditation in front of the second gate. The arrests at 7:50 a.m. were part of a week-long orchestrated effort by over 100 activists from over 20 states in the country, mobilized to oppose the U.S. drone program that uses remotely controlled planes controlled at Creech to indiscriminately drop missiles on some of the most vulnerable populations in the world. Thursday’s traffic was delayed for fifteen minutes, as Creech employees and contractors were diverted to the 2nd gate, and then to the 3rd gate once demonstrators blocked the 2nd gate. The prayer-activists at the 2nd gate were not arrested. 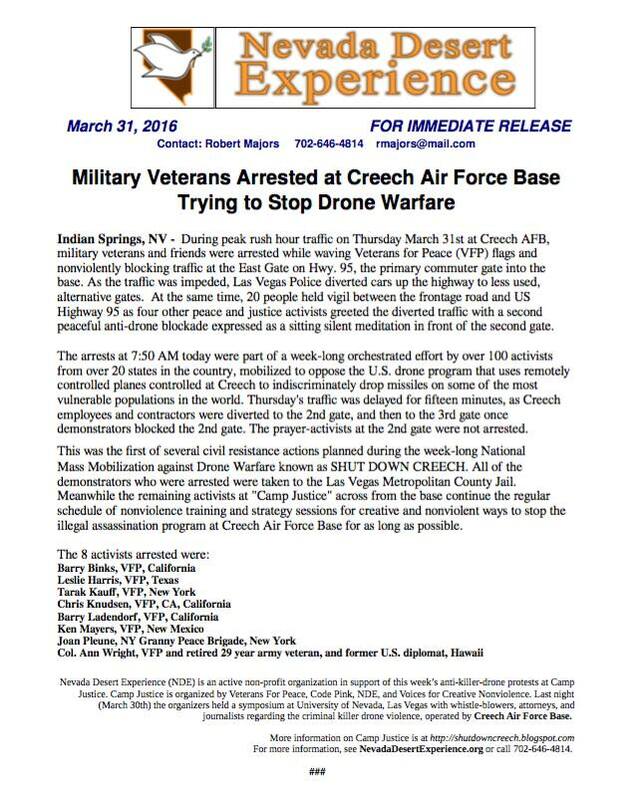 This was the first of several civil resistance actions planned during the week-long National Mass Mobilization against Drone Warfare known as SHUT DOWN CREECH. All of the demonstrators who were arrested were taken to the Las Vegas Metropolitan County Jail. Meanwhile the remaining activists at “Camp Justice” across from the base continue the regular schedule of nonviolence training and strategy sessions for creative and nonviolent ways to stop the illegal assassination program at Creech Air Force Base for as long as possible. 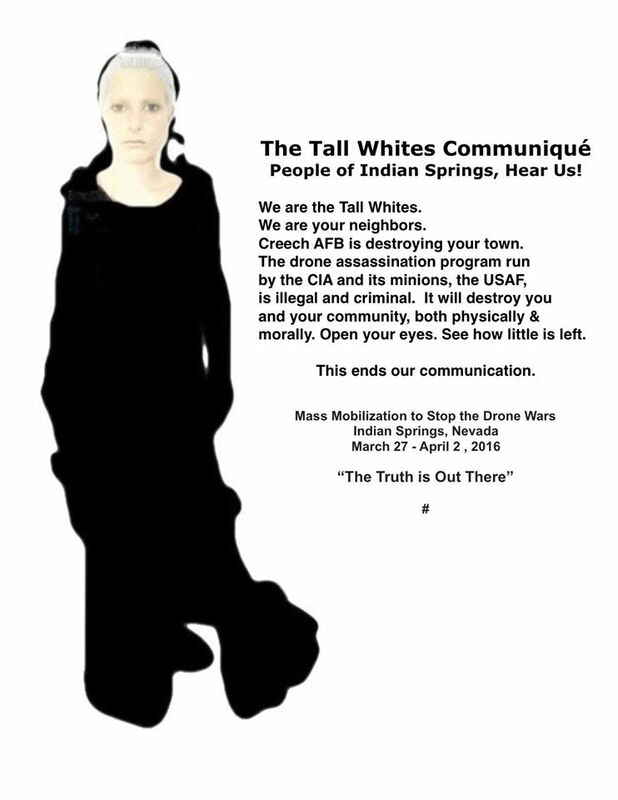 People of Indian Springs, Hear Us! We are the Tall Whites. Creech AFB is destroying your town. The drone assassination program run by the CIA and its minions, the USAF, is illegal and criminal. It will destroy you and your community, both physically & morally. Open your eyes. See how little is left. 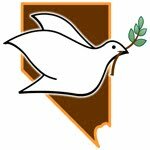 Our Sacred Peace Walk blog has been walking side by side the Nevada Desert Experience since 2010. We have been documenting articles, news, facts, links about nuclear warfare, drone/predator warfare ("robot warfare" or UAV), and the peace movement opposing these inhumane and immoral things and issues. We stand in solidarity with our sisters and brothers everywhere who oppose warfare and weapons against humanity. We promote peace, nonviolence. • to stop testing, development and use of nuclear and other weapons systems through a campaign of prayer, education, dialogue, and nonviolent direct action. nuclear abolition and nonviolent social change. • to support personal renewal through desert spirituality, reconnecting with each other and the earth to end subcritical tests and other war-making preparations at the Nevada National Security Site and preventing the return of full-scale nuclear testing. Nevada Desert Experience honors the sovereignty of the Western Shosone National Council and their commitment to environmental justice and peace for the people of the Shoshone Nation. No Nukes is good news!